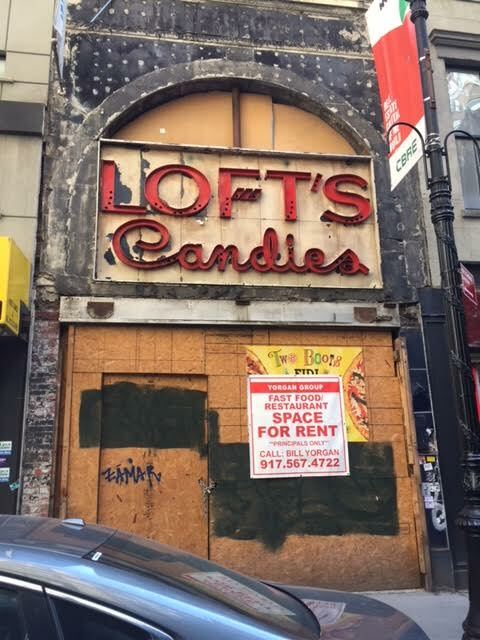 EVG reader Carl Bentsen shared this photo from Nassau Street near Fulton in the Financial District ... showing a for rent sign on what was to be the next location of Two Boots, the East Village-based pizzeria. The folks at Two Boots were also going to keep and restore that Loft's Candies neon signage that workers uncovered during renovations at the address. No word on what happened to this multi-level location for Two Boots. (They didn't respond to an email for comment.) The Two Boots website still lists this location as coming soon in the spring of 2017. Two Boots, which got its start on Avenue A (different location than its current home) in 1987, has 13 locations in multiple states. Interesting. I don't know if there is any connection, but there was supposed to be a Two Boots opening in the Factory building near where I work in eastern LIC. The "coming soon" signage was up for more than a year and then, suddenly, a pizza place (no connection to Two Boots that I can see) opened up in the space. Maybe they are rethinking things. The area - particularly Nassau Street, William Street, John Street, Fulton Street, Beekman Street - is so congested as developers are tearing down old 5-story buildings and replacing with high-rise luxury glass buildings. Chains such as 7-11, Meltshop, Chipotle and the rest have taken over. The streets and sidewalks are narrow. Due to the increase in people and buildings, building trash is piled high on the sidewalks making it impossible to walk by. Area is now a rat party. Prior to 2010 (when development accelerated thanks to Bloomberg and 9/11 giveaways) there was no traffic. Some streets did not even have lights. Traffic is now at a standstill - constriction vehicles, Uber, Fresh Direct etc. I found the article and no date was given, but it was probably a century ago. My father's business was on Beekman Street and later Park Row and I worked for him through college. The changes there are mind boggling. I'm just happy to see the area revitalized. It had become so dead and dreary since my childhood in the 1960s. It's one area of Manhattan where there wasn't a need to evict long-time residents (including businesses) for development.